elixxier – Photo Blog Light settings and lighting structures for studio and outdoor photography. Tips and tricks for set.a.light 3D – The photo studio and light simulation for photographers. 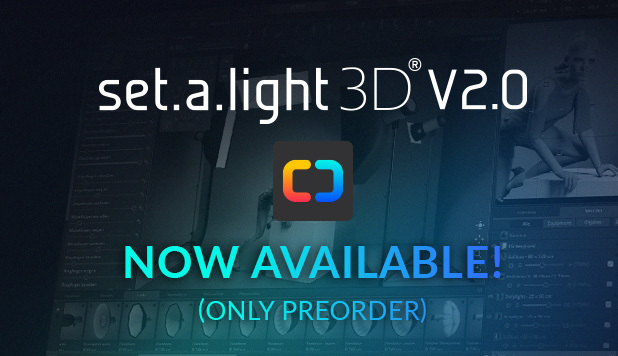 A new era is coming: set.a.light 3D V2.0 is finally there! After a long and hard time full of work we managed to get our baby ready for you. Here’s what you have to pay attention to and where to find and download the software, so make sure to read until the end! Since you supported us via your pre-order purchase, you’ll receive the software two weeks prior to all of the other customers as a bonus for your trust in us, which is NOW. The installer for V2.0 can be found in your own customer account on our website. Just log in and there you go, we’ve prepared everything for you! But be careful, please check if you really bought the new software in our pre-order. If your purchase of V1 included V2.0 (since Nov. 2017), you’ll probably have to wait for two more weeks, just like the other folks. This is because you already received V2.o without any further payments for free and the “two-weeks-earlier-feature” is, as we announced then, an exclusive right for our pre-order customers who supported us. Do I have to reinstall V2.0, or does it work as an update for V1.0? Yes, you’ll have to do a new installation and activate it with your new license. The installers (Mac/Win) can be found ONLY on our website in your account! Do my old .set-files still work? Of course they do. Just open them in V2.0 – but keep in mind, that this doesn’t work the other way round. V1 can’t open the new files from V2.0. How does the posing of the new models work? We will create a video shortly, in which we will show you how to use the tool. We will post the video later at this point. Please have a look at it, since it might be hard to figure everything out yourself. I’ve got a problem with my software / something went wrong. What can I do? You had to wait for quite some time, but it was worth it! We wish you lots of fun with V2.0 whilst trying out the new features and creating astonishing results with it! Note: With apple computers / macbooks that have been made prior to 2012 there might occur some problems. Apple supports its own graphics application “Metel” only since 2012, but set.a.light 3D V2.0 needs this to work properly. We’re actually working on a solution right now and will provide that soon! If we have any news on something not functioning, or if there’s an update, you’ll receive these news here of course! The Light Blaster – How it works! Imprint Contact Terms and conditions Privacy | Copyright © 2019 elixxier Software GmbH.All rights reserved.